If you are into fantasy baseball or football leagues you know the name Matthew Berry. The man dubbed “The Talented Mr. Roto” can be seen on ESPN or heard on podcasts everywhere breaking down who you need and should draft for your fantasy league. 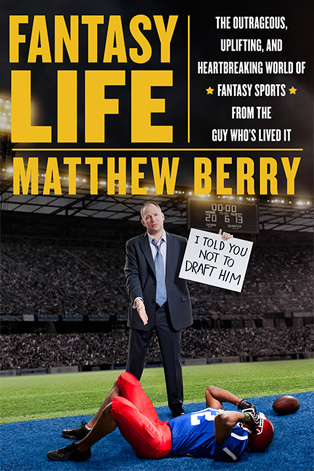 This month Matthew released his book called “Fantasy Life.” Whether you are a fan of fantasy leagues or not this is a must read. There are stories in this book that will inspire you, make you cry, make you laugh, and reassure you that you are not as crazy as you thought. There are stories of people eating moths as a rite of passage to get into one league and in another league you must get a tattoo if you come in last place. See you and your league are not so crazy after all. “Fantasy Life” is a great read. You find out where Matthew got his start in the entertainment field and at what age he started his journey into the fantasy sports world. Get the book here! Matthew was able to chat with me about the book, working at ESPN, and he even gave me his top three players that you should draft for this year’s fantasy football league. Art Eddy: Lot of questions I want to ask you, but let’s start out talking about your fantastic book “Fantasy Life.” Love all the stories that you share whether they are your own or if they are from other people like the tattoo league. When did you realize you wanted to write this book? Matthew Berry: This is going to sound a little bit trite, but it is a two part answer. The trite part is I felt like I finally had a last chapter. Book starts off with me as a fourteen year old boy in my very first fantasy league. If you have ever read my columns you know that I always put in a personal story in every single column. Every chapter has a personal story in my life starting when I was fourteen years old ending up at ESPN, married, and the birth of my daughter. So I felt like I finally had kind of a last chapter that the journey, not over, but completed. At least that particular journey. From point A to point B that coincided with the rise of fantasy sports in America. The other thing was that I had so many stories that I wanted to do something with them. I didn’t have any place to put them. You mention the tattoo league. There are these guys in Omaha, Nebraska called the tattoo league. Go to YouTube and search “tattoo league” and you will see it. It is hilarious. 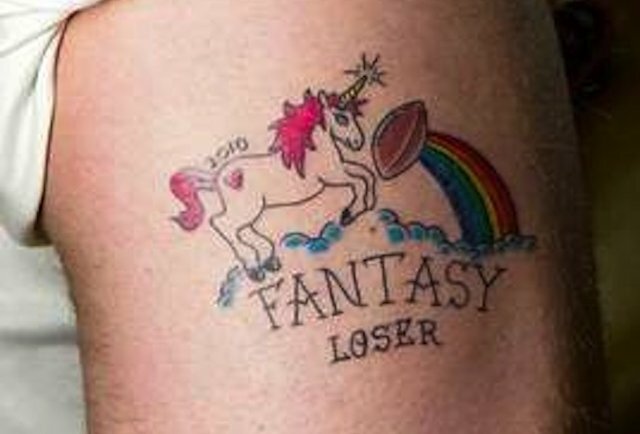 The loser of this league has to get a tattoo chosen by the winner. It is unreal. There is a twenty five year old guy that is walking around Nebraska right now with a tattoo of Justin Bieber’s face. They sent me that. They have done this for three years now. I am like I got to do something with that. I got to put this in a book. I got to do something with this. So those were the two things. AE: You started playing in fantasy leagues at the age of fourteen. There are a lot of mentions in your book where how leagues worked back in the day to now. Smartphones and tablets help people out these days. Are you a traditionalist or are you happy with all the great innovations there are now for the world of fantasy leagues? MB: To answer your question it is a little bit of both. Obviously I like the fact that I can play fantasy football on my phone or my iPad. The one thing that I am old school about is and is kind of disappointing is that thanks to all the great advances in technology you no longer have to be in the same room to draft. I think that it lessens the experience. They are going to go to his work and do the draft while he is at work. The place where the guy was working was the Red Robin restaurant, where he was dressed as the Red Robin. Every ten minutes or so he would waddle over see what they picked. As he said it turns out a cheat sheet in taped inside my beak was not ideal. But he ended up getting it done. You can do it online and you can do it from your phone, but that is a memory that they will always have. It was the most fun draft that they ever had in the history of this league. 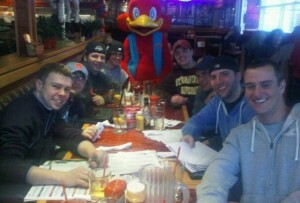 I got a picture in this book with nine guys and this guy in a big red bird costume. 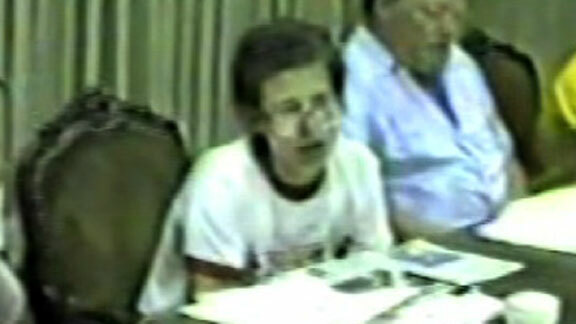 It is just one of those things where I think that I am old school in that you need to be in the same room to draft. I hate the online draft. AE: Speaking of pictures in the book. How many times do you get a Napoleon Dynamite reference when people see that picture of you when you were fourteen? MB: Every time. I think that I have a lawsuit there. I got the big frizzy hair and the thick glasses. It was brutal. I absolutely have a lawsuit against Napoleon Dynamite. AE: I am a big fan of fantasy leagues. I love being in them. Not only does being in a league make the NFL more interesting, but the relationships that are created and maintained is something you illustrate in your book. I love the story about BJ and his friends coming to visit him in the hospital. With all the stories you have seen it just goes to show the reader how strong a bond people have in these leagues right? MB: Absolutely. They are an extended family. They are the people who you become closest to. I think that is one of the themes that is in the book. It is sort of what fantasy means. There are a lot of wacky hijinks obviously. There are crazy stories, but there are also stories about fantasy bringing people together. Families, husbands, wives. I talk about the league that I do with my wife, my kids, their friends, and their parents as well. Fantasy brings people together. AE: How many texts do you get from your close friends for help with their fantasy team? Any sport worse than others? MB: Maybe ten or fifteen, not a ton. Most have already emailed me earlier in the week. I get some panicked texts Sunday morning, but not a crazy amount. I get a couple thousand tweets. It’s insane. There is no lack of people trying to get advice one way or the other. AE: For people who are looking to get into fantasy leagues, is football the best sport to try first? MB: You should join a league with a sport that you love. If you are a baseball fan and not a football fan it makes a lot more sense to go there. In general you are right. (Football) is a shorter season. There are less players to know. In fantasy football it is mostly the stars that you are drafting. It is the quarterbacks, running backs, wide receivers. It’s a tight end. It is a team defense. So it is all name players. Baseball and basketball go a little bit deeper. It is an easier barrier to enter. There is also a lot more people playing, so it is easier to find a league. I feel like everyone has a fantasy football league. AE: You are a father and you say you do a few leagues with the family. Isn’t that a great way for a family to bond? Well unless you are Michael All who beat up his 66 year old dad over their fantasy league. When you saw that story did you question if that story was even real? MB: Yea. I found it through news reports. It is one of those things where you say where did life go wrong? What happened on the path where you find yourself in a fantasy league with your father and then beating him up over payouts? The thing that I love about that is can imagine you got to jail and you get your one call. The kid, his one call is like, ‘Hey mom, can you bail me out of jail? I kind of beat up dad.’ What the hell? AE: Speaking of fatherhood your chapter on cheating is a good way to show your kids that cheaters never win. Just another great way fantasy leagues help us in life. 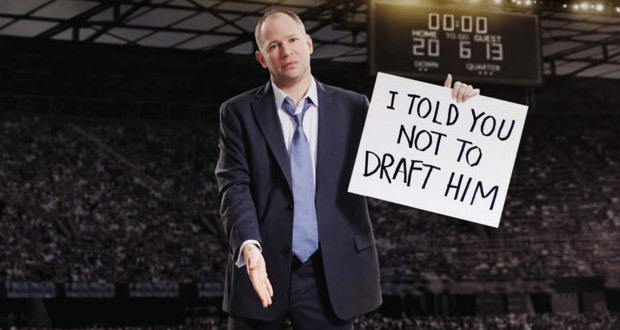 Do you talk to your kids on cheating using your family’s fantasy league as an example? MB: Well for us it is a very low stakes league. So no, we never had the opportunity. Something hasn’t come up where we needed to address it. I am the commissioner of the league. I run it with a strong firm hand. The kids have been raised right so they know in general cheating is wrong. AE: Right now for fantasy football who are the top three guys in order you have going first, second, and third in this year’s draft? MB: I think you have to go running back early this year. At the moment I have Adrian Peterson, Arian Foster, and Doug Martin.